Lynn Parnell and Ashleigh Drexler attended the 2nd Annual Ethics Seminar on Saturday, November 7, 2009 in Tampa. 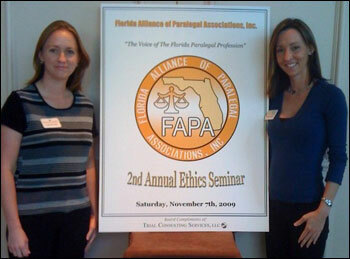 Lynn Parnell and Ashleigh Drexler (pictured above) attended the 2nd Annual Ethics Seminar on Saturday, November 7, 2009 in Tampa, which was hosted by the Florida Alliance of Paralegal Associations, Inc. This seminar is one of the many that they will attend to maintain their Florida Registered Paralegal certification offered by the Florida Bar. Currently there are only 3,316 Florida Registered Paralegal Members. A Florida Registered Paralegal is one whom is registered under Rule 20 and has achieved a standard of education, work experience, and/or national certification. Topics discussed at the 2nd Annual Ethics Seminar were: The Ethics of Representing the Guilty, presented by Mark Eiglarsh, Esquire, Offshoring of Legal Services: The Many Ethical Concerns, presented by Pamella Seay, Esquire, Ethical Dilemmas in a Down Economy: What We Should All Know presented by Joryn Jenkins, Esquire, A Paralegal's Guide to the Ethics of the Modern Law Office, presented by David Heffernan, Esquire and Ethics and the FRP, presented by Scott Rubin, Esquire.